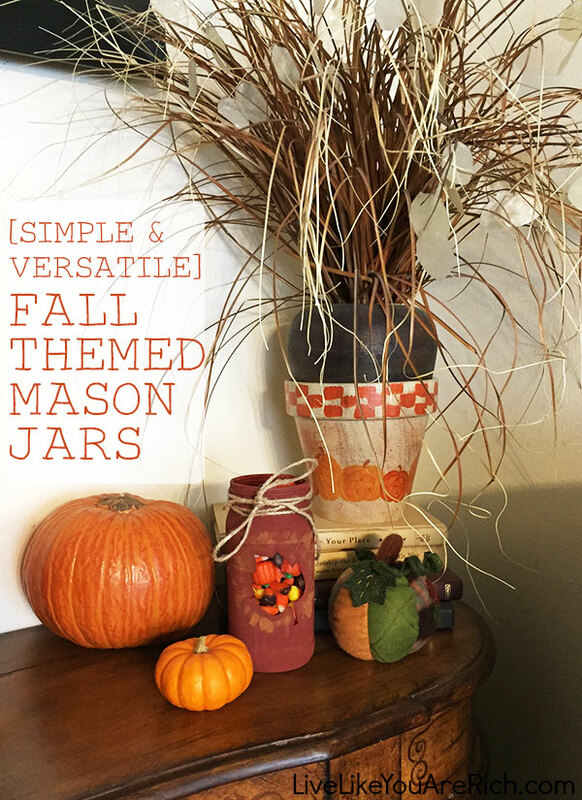 These simple ‘Fall Themed Mason Jars’ are a great way to add a little festivity in your home. 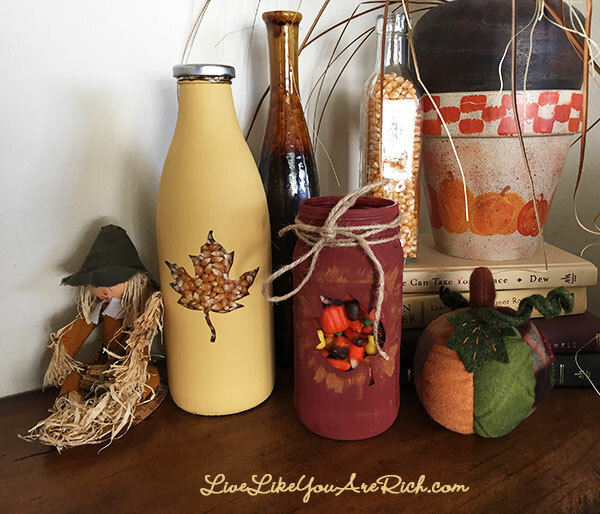 They are great for Halloween and Thanksgiving and are inexpensive to make! Further, mason jars are very versatile. You can put whatever you like in them. Some ideas are: popcorn kernels, fall leaves, beans, candles, candy corn or other seasonal treats, and/or use it as a vase. The possibilities really are endless. You can easily switch the color and the ‘window’ design as well. 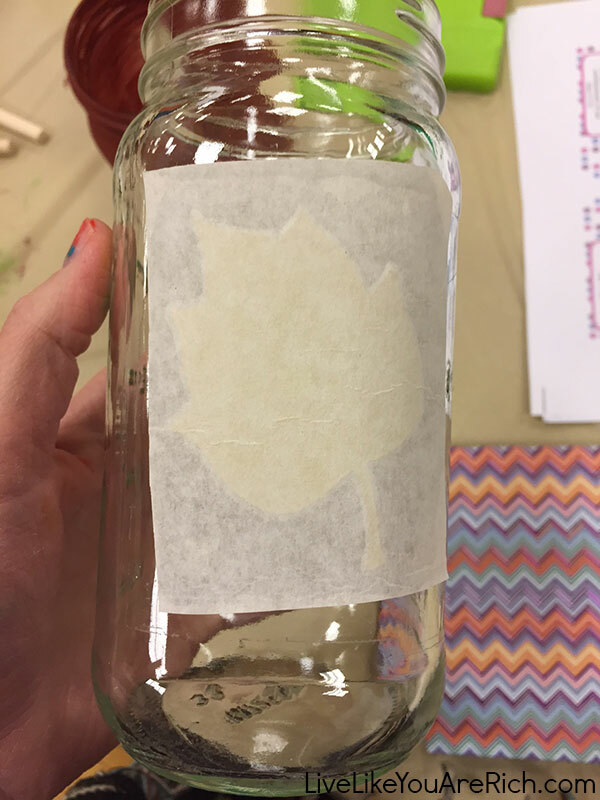 1- Use a Cricut to make a leaf cut out. Peel back the wrapper so the vinyl leaf is exposed. 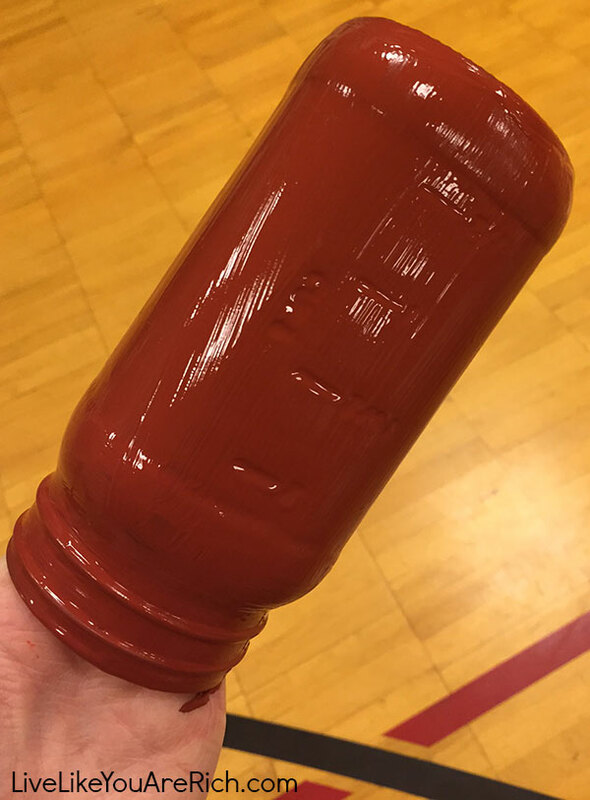 2- Paint the outside and bottom of the jar completely. You’ll paint over the vinyl leaf. 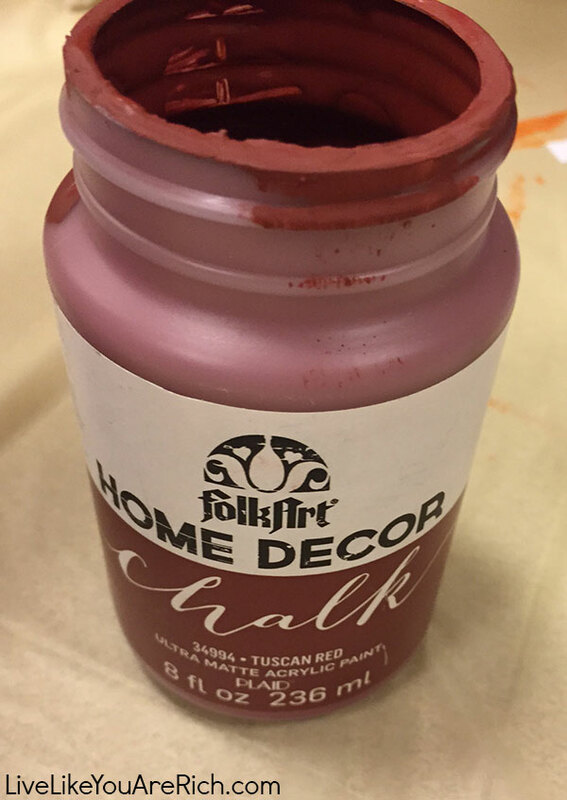 I used Folk Art chalk paint in Tuscan red. 3- Let it dry for 20 or so minutes. Then peel off the vinyl leaf. Add string, or ribbon or additional paint for embellishment. 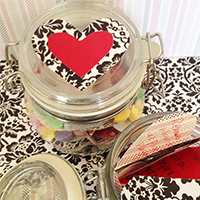 And fill the jar with whatever your heart desires. Once the supplies were out and ready to go this jar took me a total of 3 minutes (not including drying time)!! I plan to make a few more of these jars. I’ll be making them in this Tuscan red but also in a yellow. 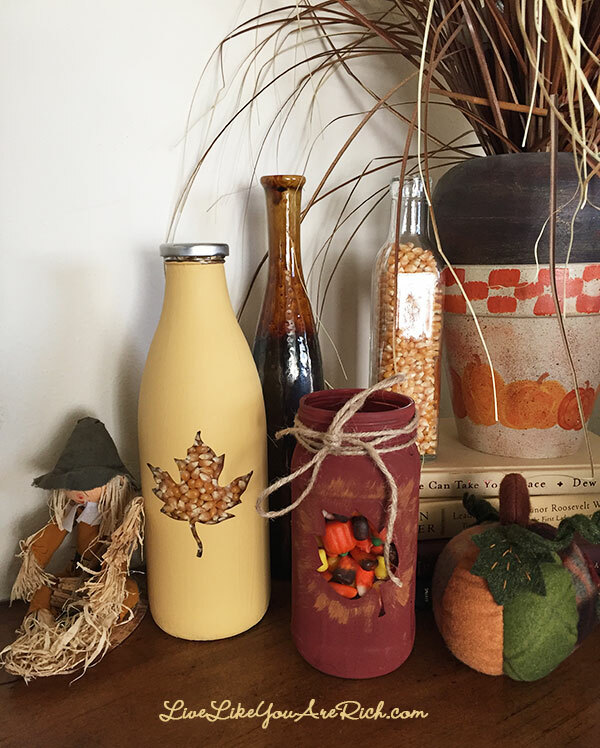 I’ll fill one with popcorn kernels, maybe one with dry beans, and another with a Thanksgiving style bouquet type of arrangement. When/if I finish them I’ll add photos here. Finished- I made one more in yellow with popcorn kernels in it! Enjoy this simple, quick, and versatile craft. Can’t wait to see the winner. When will they be announced? Once we hear back from them. If they do not reply we will draw another winner. Kathleen won the circuit and I’m waiting to hear back (I’ll only wait another day or so). Kathleen is the winner and just got back to me. But next week I am giving away another Cricut! So please enter again. 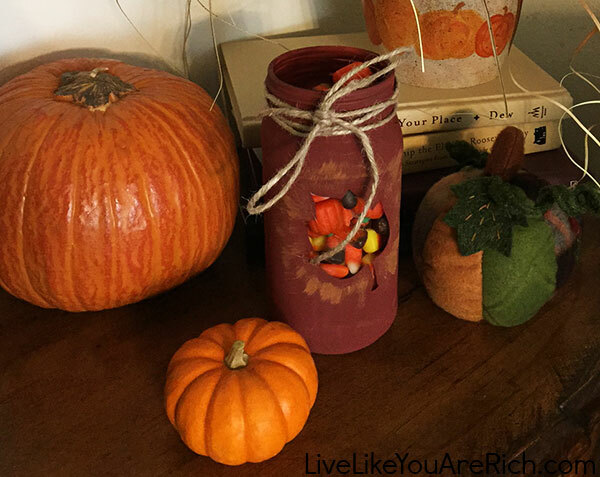 I will try to decorate mason jars at home for this fall season.